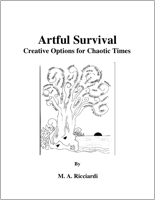 An inspirational manual of creative survival with a wealth of alternative income tips, resources, references for surviving "artfully". More than just a ‘how to’ book, far more than simply a reference guide for creative money-making ops, Artful Survival is a revelation of a way of life drawn from the lives and habits of real artists and other “cultural creatives”. It is a response to the times we live in. These types of people — the at times eccentric, artistic “fringe”-- generally weather hard times fairly well (even if their art doesn’t sell), but this is as much about perspective and attitude as it is about exploiting your creative abilities. Artful Survival does not advocate that every reader should radically change his/her life and become an artist (though it discusses this scenario). Rather, this content-rich book encourages adopting some of the strategies, habits, and “beatitudes” typified by the community of artists and cultural creatives -- to enhance/expand the reader’s perspective on life (and the many ways a life can be lived) and to diminish the day to day stresses of economic hard times. Throughout, the author draws upon his own, REAL experiences and those of his creative friends and associates. He has, in nearly every example, actually lived it, done it, or personally knows someone who has. Artful Survival offers the reader a "portal" to an entire universe of new possibilities. M. Ricciardi holds an interdisciplinary degree in Communications, is a “semi-retired” teacher of Art and Science, a naturalist, a well-published writer (essays, interviews, reviews, poetry, some fiction), a sometimes multi-media performance poet, an internationally screened, award-winning video artist, concept/art/tech designer, a multiple arts grant recipient, and a former professional illusionist.